So how cool is this? For coming back to Blogville, I was awarded a giftie! I opened up my package earlier this week and was the lucky recipient of The Book of Barkley! If you haven’t read this, please do. I really enjoyed the tale of Barkley, hearing his inner voice describe how he feels trying on a Thundershirt, hearing about L.B. chase him as a pup in her jammies when he was scared of a local BOOM and envisioning him peeing in front of her boss’ window. Ah, we’ve all shared similar little somethings, that, as we all know, add up to bigger loves of our lives. Thank you for my book L.B., and thank you for your warm welcome back! Oh how cool!! We will have to check that out! And to think Lyndon Baines Johnson mistreated his beagles (Him and Her) by pulling their ears. Thanks for sharing. I’ll tell my Human about the book. Maybe she can get it on her reader. WTG WHAT A GREAT PRESSIE, we are surely glad you 2 are back! OMD that is super. Congratulations and THANKS fur coming back!!! We were so happy to welcome you back to Blogville and thank you for sharing the book. Amazon has it both in paperback and Kindle (Mom likes the dead tree kind of reading). 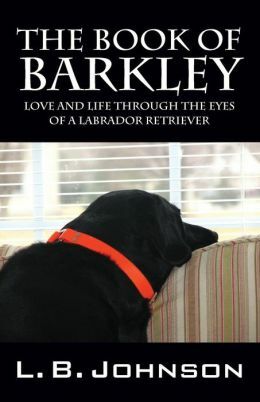 Mom donates all of the sales of The Book of Barkley, plus her new book on human and animal adoption, to Animal Rescue non profits and the Search Dog Foundation. I am glad you are back. I missed you while you were gone and always looked at the comments you left over at Sammy and Wally’s blog . Lee says she often wonders what I am thinking an if I could talk how the story of our lives would sound. Glad you won the book. Lee says keep an apple handy to entice the pony back with. Always worked on her Grandmothers farm. Its so cool you are back we had no idea!